When Manny Pacquiao defeated Oscar De La Hoya on December 6, 2008 in a welterweight showdown, the glorious performance was his introduction to the sports world that he’d officially arrived. Although boxing fans were well aware of his abilities, taking down a legend, even at the end of his career, was confirmation that Pacquiao was ready to take control of a sport that sorely needed someone with his character and magnificent skill set. Similar to his megafight with Floyd Mayweather Jr., De La Hoya stalked the smaller Pacquiao from the opening bell. Staunch De La Hoya supporters could not envision a scenario where a fighter who ruled the 130-division could possibly get inside and hurt the 5-foot-11 inch champion. Conversely, Pacquiao fans questioned De La Hoya’s ability to fend off Pacquiao in attack mode. Early on De La Hoya stalked Pacquiao as the Filipino champion moved to his left, which some would criticize as making him easy fodder for that vaunted straight right hand. De La Hoya missed with a big hook and came up short with his right hand, and Pacquiao landed first with a sharp straight left and right hook. Judging by the first three minutes of the fight, one thing was evident – Pacquiao’s defensive skills were the best he’d ever displayed in his career. He will need that same type of movement against Mayweather. The brilliant lateral movement, consistent head feints and ability to step to his right and escape off the ropes were magnificent. In addition, Pacquiao accentuated his performance in the opening round by landing five straight left hands against a taller fighter who doesn’t take much punishment. Increasing his punch output while intensifying the frequent ambushes, Pacquiao landed a pinpoint right hook to start the second round. More importantly, Pacquiao made De La Hoya miss five jabs during the round. In the final 15 seconds, Pacquiao landed a left hand and slipped away to his right, a move he would perfect against Ricky Hatton. Although De La Hoya had moments, especially when he turned to the body in the next round, Pacquiao began to pick off right hands and shoot his counter left. As the fight has begun to intensify, Pacquiao gained confidence and points with powerful hooks off of his jab. Confronting De La Hoya’s legendary power is a frightening task for any fighter; Pacquiao no longer appeared concerned about the harsh repercussions. In one instance when De La Hoya came forward, Pacquiao forced him back with a beautiful jab to stomach and hook to the head. For the first time in his career, De La Hoya could only sit back and watch as Pacquiao landed several clean shots toward the end of the second round. Still it was hard to count out De La Hoya, a fighter with such power and supreme boxing skill. Just under the two minute mark of the fifth round, a careless but determined De La Hoya got hit with the biggest punch of the fight – a right hook thrown from a distance by Pacquiao. From there, Pacquiao followed De La Hoya and implemented a calculated body attack. Not to be outclassed, De La Hoya landed four impressive uppercuts of his own. Instead of countering, Manny took the lead in the sixth. To the crowd’s delight, the men brawled for the first time. But as Pacquiao’s varied attack evolved, De La Hoya’s became virtually dormant. Pacquiao closed the gap to land short, crunching hooks and doubled up on the straight left hand. The slower De La Hoya was overwhelmed by Pacquiao’s speed and could no longer match his energy. In the seventh round, a rejuvenated Pacquiao took De La Hoya to the ropes and unleashed an eight-punch combination with a short left hook doing the damage. 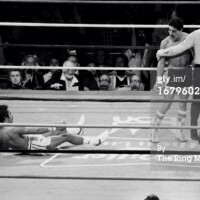 But it was not merely a boxing lesson; Pacquiao was battering a legend who was now merely trying to survive. Pacquiao was at his absolute best against De La Hoya. Offensively, Pacquiao won’t be able to duplicate the attack he exhibited back in 2008, but if he can utilize some of those same defensive skills to make Mayweather miss his jab and deter him from getting into a rhythm with his right hands, then those skills will help him immensely. Dismantling a legend in such a convincing fashion was an amazing accomplishment for Pacquiao and it propelled him to even greater heights, but it also showed Mayweather that he has the tools – a jab, lead hook, movement – to get inside on a bigger fighter and dominate him. Prior to getting into the ring on May 5, 2007 at super welterweight, Floyd Mayweather Jr. and Oscar De La Hoya had strategized thousands of times during intense training sessions to offset each other’s strengths. For Mayweather, it was De La Hoya’s dangerous left hook, and for De La Hoya, it was Mayweather’s brilliant boxing skills and piercing right hand. Despite the pre-fight hysteria, both men held a mutual respect for each other inside the ring. As soon as round one opened, a complex psychological battled ensued and carried over to the final bell. In some ways the first round mirrored the same approach taken by both fighters in the final round: Mayweather shot the jab and check hook with some success, while De La Hoya pushed him to the ropes and railed away with successive hooks to the body, some more crowd pleasing than effective. Embracing the aggressor role, De La Hoya’s persistence never waned; even when he missed five or six punches in a row, he was not deterred. During an exciting second round, De La Hoya opened up a sophisticated attack, where he took advantage of Mayweather against the ropes and in the middle of the ring. First, De La Hoya landed a hook, then missed a barrage, but stayed focused enough to land a jab and then a clubbing right hand. Then, with forty seconds remaining, De La Hoya used his jab to set up another one of his combinations, but Mayweather quickly closed the door by clinching and moving out of harm’s way. This round represented the blueprint for how to fight Mayweather; yet, there was one caveat as De La Hoya, unlike many opponents, had the size (5-foot-11), strength, and speed to pull it off. Reflecting the intensity of the previous round, Mayweather came off the stool and immediately landed a counter hook, but then absorbed several body shots from De La Hoya. In a crouched stance, De La Hoya followed Mayweather around the ring, furiously looking for an opening. Although Mayweather was able to use his patented shoulder roll to defray most of the incoming punches, he still couldn’t avoid getting hit with counter right hands toward the end of the round. The ultimate chess match was unfolding as Mayweather was content to be economical early, in contrast with De La Hoya, who knew that throwing a lot of punches was a key element to a victory. Similarly, when Pacquiao and Mayweather face each other on May 2, a determining factor will be Pacquiao’s pressure vs. Mayweather’s precision. By the fourth and fifth rounds, Mayweather adapted and recognized the need to use his speed, and keep the fight in the middle of the ring. As De La Hoya still landed effectively, it was Mayweather’s arsenal of right hands at the end of both rounds that concerned Oscar supporters. In the seventh round, De La Hoya attempted to maintain his physical style and disrupt Mayweather every time he tried to find a rhythm. Even though De La Hoya never had the same success as he did in that second round, he still landed those chopping right hands and straight counter rights above Mayweather’s guard. At one point, De La Hoya missed wildly on four power punches and then landed the fifth. Surprisingly, his punches had not lost their velocity. Usually Mayweather has drained his opponent’s energy by this point in the fight, but De La Hoya showed few signs of slowing down. In the second half of the seventh, both men traded moments as De La Hoya put on an impressive and consistent jabbing display, while Mayweather threw that wide right hook to the body and frequently went to the left hook to the head. De La Hoya ended the round with a barrage of hooks as he pinned Floyd in the corner; Oscar wasn’t as judicious as Floyd, but his punches were landing. The urgency of the situation was not lost on Mayweather, and the next three rounds proved how being the best conditioned boxer allows him to dictate the second halves of fights on his own accord. In the eighth, Mayweather ignited an effusive attack where he landed his best combination of the fight – an uppercut and a straight right hand. In the ninth and tenth, Mayweather fought from a crouched position to slip De La Hoya’s right hand counters, and doubled up on his right hand, while controlling the pace of each round. An exhausted De La Hoya could not longer get his punches off, and Floyd timed him perfectly. The last ten seconds of the tenth were indicative of how dangerous Floyd is late in a fight. First, De La Hoya took Mayweather’s bait and got nailed with a jab; then – knowing full well he had only seconds to spare – Mayweather made De La Hoya miss, came back to his left, threw a harmless left hand and then landed a huge right hand that as the bell sounded. De La Hoya accepted the reality and forged ahead. A determined De La Hoya landed significant punches in the final two rounds, and he even got the crowd into the fight with a final round attack, but Mayweather had already left his final imprint on a close fight. The fighters embraced at the bell. Even at this stage in his career, Mayweather can adapt to any situation. Several years later, Mayweather can’t access the same lateral movement, but he will be able to analyze Pacquiao’s weaknesses early and make necessary changes. Also, Mayweather owns the late rounds in every fight, so Pacquiao will have to find a way to pace himself and preserve his energy in order to not let Mayweather take over and run away with the fight late. A week prior to the split, politics and boxing were already intertwined when Argüello came into the ring against Bazooka Limon on July 8 displaying a dark red and black Sandinista robe. Critics viewed the act as an idea concocted by Roman to appease a new government that was in position to take over. Conversely, Argüello supporters downplayed the incident.